Shortly before my reunion ten years back, I found myself strangely moved by the remarks sent in ahead of time by my high school classmates. Among them were a Restaurant Owner, and a Sheet Rock Installer, an Engineer and a Supervisor of Accounts Receivable. They wrote that they remembered hanging out after school, pulling the fire alarm senior year, skipping gym and smoking in the girls’ room. I wanted to go to that reunion but I had been shy in high school, and way too serious. Back then, I yearned to be accepted by those same ones who skipped gym to smoke in the girls’ room. I was the kind of kid who faked sick in gym class so she could sit in the stands, doing the next night’s homework. By just about this time that year, I still wasn’t sure if I would go. David wouldn’t be coming, we agreed. He knew almost no one in the class and I knew my reunions were a torture to him. Then, about a week before the event, I ran into the only classmate who lives at all near me. She asked if I were going, then turned to her daughter. “Mrs. Marotta was a nerd in high school,” she said pleasantly to the child. That cinched it somehow. I’d go, all right. Plainly I had nothing to lose. I called up a couple of people and we made plans to meet there. It was sad to see who had not come. But the ones who had were fully there, and I found myself talking to people I had hardly known before. And I couldn’t help but note that there was none of the judgment or constant evaluation of earlier days, all of that having given way to something kinder. Back in high school, I was on the chubby side and had a short curly bob. I clanked with bracelets and swaddled myself in breath-squeezing cocoons of fabric. But chubbiness ended for me when I turned 21. I grew my hair to shoulder length and have pretty much kept it there ever since. So the night of the reunion I wore a simple black dress and hoop earrings. Now I’m not saying I looked great. No doubt I looked better back then, even batter-dipped in baby-fat as I was. But I felt… freer somehow, less encumbered, on every level. We had all been watching the dancing, specifically the dancing of this one classmate who somebody said taught Ballroom Dance as a part-time job. Part way through the evening he came over and asked me to be his partner. “But I don’t know how to do the steps,” I stammered. “Just follow,” he answered, putting his hand on the small of my back. At first I kept looking down at his feet. Eventually, I took his advice and let him lead. I closed my eyes and felt… weightless. 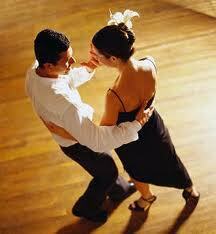 In the course of the evening, I think I danced with him three times. He thanked me all three times, bowed slightly and walked away. I never even caught his name. I found it out ten years later from the other people I worked with on the committee to plan our last reunion. His name was Tom, and he died shortly after that night. But as I think of him now, I think of what I learned from him that night, which as I look back, seems emblematic of our human journey: The way, nervous at first, we mount the stage of our emerging life. The way, after a while, we learn to leave doubt and self-consciousness behind. Time does the rest, for it is Dance Master Time who holds us, really. We lean back. Maybe we close our eyes. It turns out we need only follow. I too was one of the “shy ones” in 1966 but I was told by my kids to go to that same reunion. My meeting you there and having my picture taken with you was the high point of the night which was a very enjoyable evening all around. I am so shocked that you were so self conscious as a child because when we met you for the first time at Cal and Graces Camp Fernwood we fell in love with you and Nan and you especially were our darling cousin. So tenacious and we loved the way you looked. This was a very touching piece for this time of year when reunions are just finishing. I had to send it to a friend. It is so inconsequential, High School I mean in the long run that life gives us. I am totally ashamed of some things I did and all is forgotten when we reunite years later. We have to just let it go. thanks – let’s meet for dinner soon! November 9th? Thanks marti … Just looking at the Viking River Cruise catalog. Paris and Normandy next spring? How about dinner someplace in New Hampshire ha ha! I’ll settle for that right now! love this. what a wonderful night of dancing and bliss that must have been.